4.2 out of 5 based on 62 bloggers and 8 commenters. 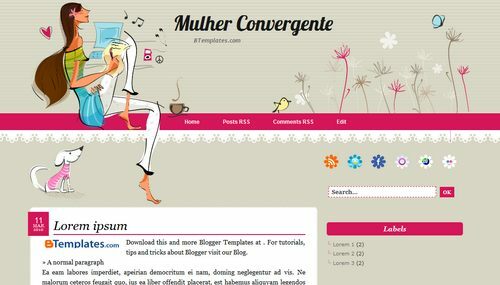 Mulher Convergente is a free blogger template with 2 columns, right sidebar, rounded corners and girly looking. Excellent template for blogs about music. Hi – I’m having trouble trying to insert my own facebook link into the link spot above the search bar. Can you help please? It’s very beautiful but I have the same trouble like @Fawn. It’s impossible to insert your own facebook, twitter, etc. in your blog on blogspot! Any idea?? why does the very bottom say pagina(page) at the bottom. is there a way to fix this? Eu abri ese modelo de template mais só dar erro,me ajudem!!!!!!!!!!!!!!!!! I had the same problem with the blogger attribute at the top of the page, if you go into the html and find the attribute line you can delete it or move further down in the list to make it leave the top. That will also fix the line problem. I wondered if anyone had problem with creating pages with this layout. Only one image and all text shows up. When you click “read more” it doesn’t show more when there should be more on the page.